“Cash” is a gentle, pretty gray gelding, standing 15 hh. tall. He is well put together with good foot and bone. His easy-going personality makes him a joy to be around. Cash is a nice prospect coming into the prime of his life. He is soft in the face, lopes around collected, will ride off of your seat, and has a nice stop. He is dragging the log in the arena and lightly tracking cattle around. Cash is good to ride outside as well – will cross a tarp, step over logs, and goes wherever you point him. He has a good handle and the tools you need to take him to the next level, whether it be in the arena or using him on the ranch! He sells 100% sound. 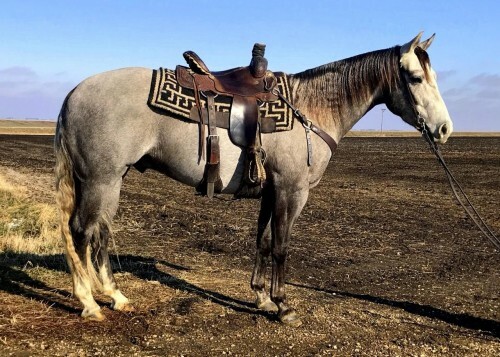 This gelding sells hip #20 at the Five Star Horse Sale in Iowa Falls, Iowa on February 2, 2019.